PRESS RELEASE: In anticipation of its debut at the Winter NAMM 2011 exhibition next week in Anaheim, CA, MOTU has unveiled the 828mk3 Hybrid, an enhanced version of their popular 828 audio interface that now provides flexible connectivity to Mac or Windows computers via Firewire or high-speed USB 2.0. 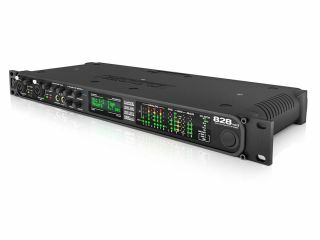 The 828mk3 Hybrid provides professional audio quality at samples rates up to 192 kHz, along with all the audio I/O needed for a personal recording studio, including two mic/instrument "combo jack" inputs, eight line-level analog inputs, ten channels of analog output (with XLR main outs), 16-channels of ADAT optical digital I/O, stereo S/PDIF, and a stereo headphone output. The rear panel of the 828mk3 Hybrid provides both Firewire A (400 Mbps) and hi-speed USB 2.0 (480 Mbps) ports. Users can connect the 828mk3 Hybrid to their computer using either format for full-featured operation and ultra-low bus latency. The Firewire jacks on the 828mk3 are Type B jacks, but they can be connected to any Firewire port on the computer(Type B, Type A, or miniature Type A) using any standard 9-pin-to-9-pin, 9-pin-to-6-pin, or 9-pin-to-4-pin Firewire cable, respectively. >> 28 inputs / 30 outputs -- there's no channel sharing in the 828mk3 Hybrid; the mic inputs, ADAT optical banks, S/PDIF I/O, headphone out, and main outs are all active simultaneously as separate channels. >> Hardware sends -- add your favorite outboard EQ, preamp, reverb or other processor to the two mic/guitar inputs, before the signal goes digital. >> V-Limit™ clip protection -- hardware-based input limiter on both mic/instrument inputs prevents digital clipping and distortion from overloaded signal levels up to +12 dB over zero. >> CueMix FX™ -- flexible on-board 28 input/16 bus digital mixer with effects, including reverb with sends/returns, plus EQ and compression on every input and output. >> Classic Reverb™ -- provides five different room types, three frequency shelves with adjustable crossover points, shelf filtering and reverb lengths up to 60 seconds. >> Two forms of compression -- a standard compressor with conventional threshold/ratio/attack/release/gain controls and the Leveler™, an accurate model of the legendary LA-2A optical compressor, which provides vintage, musical automatic gain control. >> Modeled EQ -- provides 7-band parametric EQ modeled after British analog console EQs, featuring 4 filter styles (gain/Q profiles) to effectively cover a wide range of audio material. LP and HP filters are also supplied with slopes that range from 6 to 36 dB. >> CueMix FX cross-platform mixing software -- attractive graphic mixing, graphic editing of parametric EQ and a convenient tabbed interface for quick access to all features in one window. >> Instrument tuner -- provides graphic interface and accuracy to within one 10th of one cent (1,000th of a semi-tone), plus a test-tone generator. >> Advanced audio analysis tools -- includes full-screen real-time FFT display, spectrogram "waterfall" display, oscilloscope, X-Y plot and linear or polar phase analysis. >> Front-panel control -- access any setting in your entire 828mk3 Hybrid mix directly from the front panel. >> "Reverb return" stream -- allows users to record or mix 828mk3 Hybrid reverb output separately in their DAW. Effects can also be applied when the 828mk3 Hybrid is operating stand-alone (without a computer) as a complete stand-alone mixer. >> Stand-alone operation -- program your mixes at the studio and then bring the 828mk3 Hybrid to your gig, no computer needed. Need to tweak the mix? Do it on site using the back-lit LCD and front-panel controls. >> Multiple CueMix FX mixes -- for example, create different monitor mixes for the main outs and headphones. Or add send/return loops for outboard gear with no latency. >> Two combo jacks provide 1/4-inch guitar input or XLR mic input with phantom power, pad and plenty of gain. >> Eight 24-bit 192kHz analog inputs and outputs on balanced/unbalanced 1/4-inch TRS jacks. >> Precision Digital Trim™ -- Digitally controlled analog trim on all analog inputs (mic/guitar inputs + quarter-inch TRS inputs) provides accurate adjustements in 1 dB increments. Fine-tune the balance of your analog inputs and then save/recall trim configurations. >> Direct Digital Synthesis (DDS) clock -- a DSP-driven phase lock engine and internal clock source that produces imperceptibly low jitter characteristics (below the noise floor), even when the 828mk3 Hybrid is resolved to an external clock source via SMPTE time code. >> Time code support -- directly resolves to (or generates) time code via any quarter-inch input or output, without the need for an extra synchronizer. >> Sample-accurate MIDI -- connect a MIDI controller and/or sound module with no separate interface needed. MIDI I/O is sample-accurate with supporting software. >> Expandable -- add additional interfaces for more I/O as your needs grow. >> Separate XLR main outs with front panel volume control. >> Stereo 24-bit 96kHz S/PDIF in/out. >> Includes native 32- and 64-bit drivers for Mac and PC, including ASIO, WDM, Wave, Core Audio, and Core MIDI. Supports all popular Mac and Windows audio software. >> Includes AudioDesk full-featured sample-accurate workstation software for Mac with recording, editing, mixing, real-time 32-bit effects processing and sample-accurate sync. >> Plug-and-play operation with your Mac or PC via Firewire or USB 2.0. >> Front panel volume control for monitoring. Stereo, Quad, 6.1, 7.1 and user-defined surround monitoring setups available. >> Two front panel headphone jacks with independent volume controls. The 828mk3 Hybrid will ship in Q1 of 2011 at the same price as the original award-winning 828mk3.